Min/Max Bet: From 1 to 150 coins. 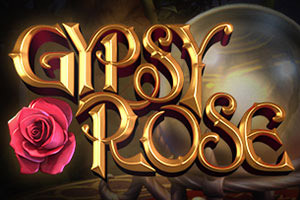 "Come closer…,let me read your fortune…"
Whispers GYPSY ROSE, and what a fortune it will be! When the WILD card occurs on reel 1 and 5, directly across from each other, either CROWS, GYPSIES, LOVE POTIONS or MAGIC BOOKS (whichever has the MOST currently o reels) will become wilds with a toss of the Gypsy's cards. When in free spins mode, the cards no longer need to be directly across from each other, the feature triggers merely when they appear on both reels 1 and 5. When the combination features 2 Love Potions, the free spins mode will trigger. 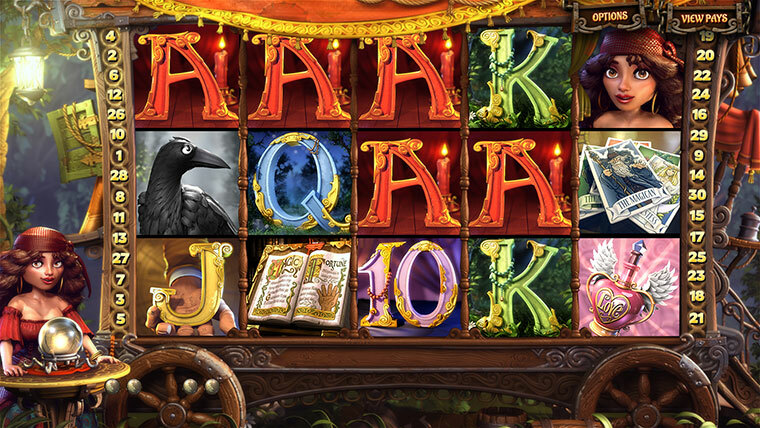 During Free Spins, as mentioned above, the Wild Toss feature can trigger no matter what position the wild cards are in, as long as they are on both reels 1 and 5 . When the combination features 2 Crows, those crows will become WILDs and the reels will automatically respin, the new WILDs locked into place. Any new wins will be awarded. When the combination occurs with the Magic Book, a big book will fly out, showing a credit award. When the combination features 2 Gypsy symbols, the tarot card bonus will begin. Select 7 cards and your prize is awarded based on how many of a particular figure you got (3 priestesses, 2 kings, etc.) and then multiplied by a multiplier based on the number of a particular color you earned.